And why not? Their only viewership is the brain dead, perennially angry, miserable, and unhappy Liberal. This is the story of MSNBC in a nutshell: It rose to prominence on its criticism of George W. Bush, peaked during Barack Obama's historic 2008 campaign, and, by criticizing Republicans and championing liberal causes, sustained its viewership in the years that followed. 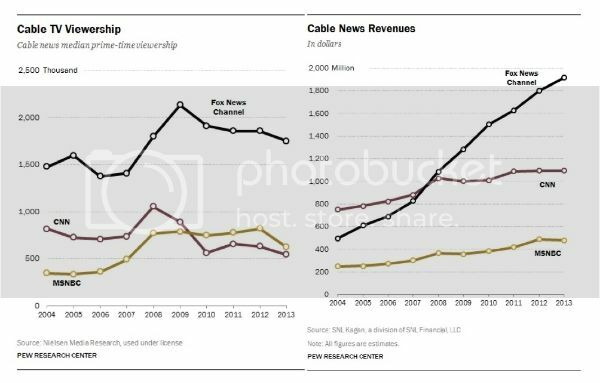 MSNBC suffered harder loses in 2013 -- in terms of both viewership and revenue -- than either of its competitors at Fox News and CNN, according to Nielsen data featured in a new Pew Research report. Prime-time viewership declined by a staggering 24 percent (nearly twice the loss sustained by CNN and four-times that sustained by Fox News). Daytime viewership fell by 15 percent, even as it rose at both of the other networks. MSNBC isn't seeing that growth, and it's not clear how it will. In a world where liberals wanted to be outraged by George Bush every night, or celebrate the rise of Barack Obama, MSNBC had a theory of the case. But now Obama's presidency has turned into a slog, and MSNBC isn't compelling. Prime time is just hours of what often seems like feigned outrage. And the daytime strategy -- giving shows to kids in their 20s and 30s, in an apparent bid to reach the youths -- is comically bad, and rendered absurd at every commercial break when the catheter ads come on. 2016 will help MSNBC, as it will help all cable news networks, but that's not a long-term business strategy. The network needs to figure out what it's going to do in the off years. There are a few powerful brands that are worth maintaining -- Rachel Maddow, Chris Matthews, Morning Joe -- but the rest is in need of a restart. Wishful thinking. I predict it will be the All Hitlary, All The Time channel and even more Leftists will abandon that sewer. She isn't compelling in the least. Two all-beef patties, special sauce, lettuce, cheese, pickles, onions – on a sesame seed bun. NBC is first and foremost a business, or is supposed to be. I wonder how much longer shareholders are going to tolerate the management losing money by using MSNBC as their soapbox on which they promote their Liberal agenda. NBC is first and foremost a business, or is supposed to be. LOL. That's rich. NBC is a DNC propaganda tool payed for through crony capitalism and crooked deals between the Regime and GE. Hell, the stock price has gone from 16 and change in 2009 up to 25 and change now. Stockholders are not going to say boo. "There are a few powerful brands that are worth maintaining -- Rachel Maddow, Chris Matthews, Morning Joe -- but the rest is in need of a restart." Looking for the problem ...in a nutshell? If those are your "powerful brands" look no further. With those three as an A-Team, I wouldn't blame anyone for forfeiting the rest of the schedule.